The case study briefly summarizes the analysis and redesign of the tolerance stack for a Smart Solenoid End Assembly (see Fig. 1) In carrying out the study the company had taken tolerance stack failure severity to be a FMEA rating of four (S = 4) and the customer required a 'worst case' analysis. 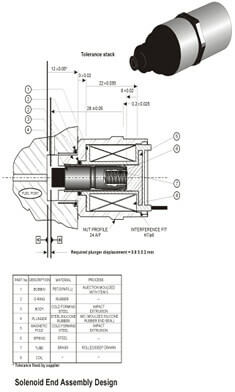 The primary design requirement was to control the plunger displacement to 0.8 ± 0.2mm. Note that the tolerance on Fuel Port Block (±0.05mm) has not been include in the analysis since it was owned by the customer. The tolerance stack starts at face A on the fuel port and accumulates through the components to face B on the Plunger seal. The analysis of the components in the tolerance stack using Tolcap is tabulated below in Table 1. The processes and materials used are shown in the Fig. 1 and in Table 1. The pole is molded into the bobbin and the pole face is considered to be a mold related dimension. 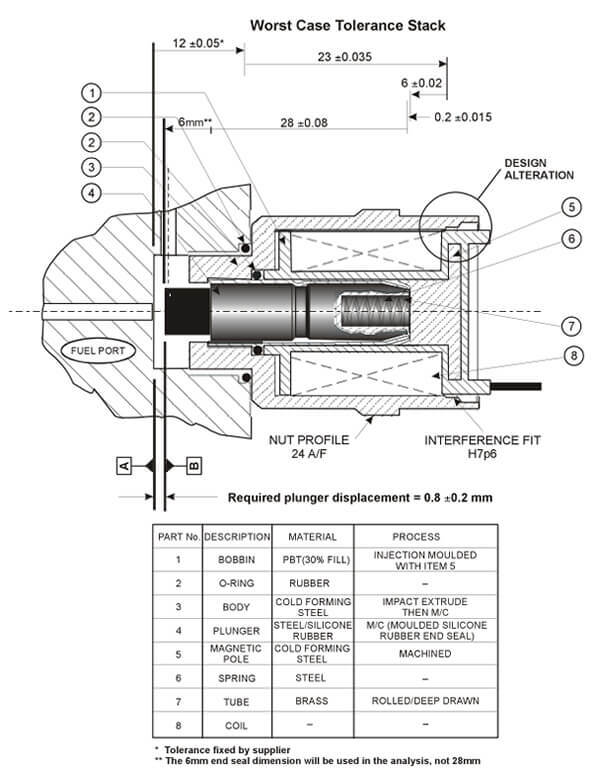 Note that the dimensional tolerance on the Plunger is 28 ± 0.05, but the analysis will concentrate on the silicone rubber seal length of 6mm as this is molded onto the Plunger and can be taken as a mold related dimension. Clearly the tolerance stack is not capable as only one characteristic is acceptable when compared with the Cpk targets (Cpk(T) in Table 1) set by the company for the stack design. The failure rate would be extremely high, given the low values of Cpk, (the associated failure cost was calculated at over $6 million per annum against product sales revenues of around $16 million). 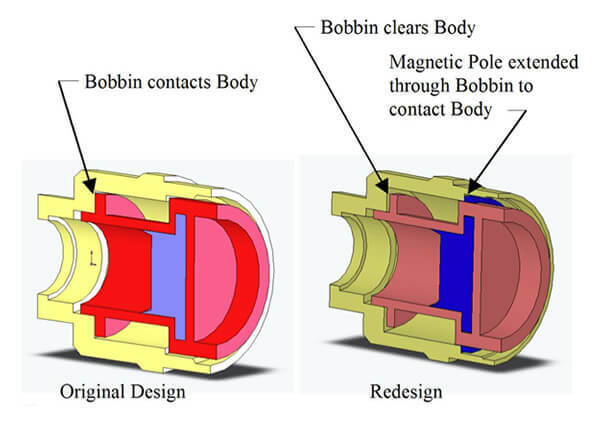 Problems with the stack resulted mainly from confusion with the suppliers about the capability of the impact extruded Body and Magnetic Pole, and with that of the plastic molded Bobbin. In connection with the impact extrusions, radial capabilities had been assumed on axial dimensions! Tolcap has separate process capability maps for each forming direction. Given these problems a redesign was undertaken, focusing on improving tolerance capability and/or eliminating problematical parts from the stack. Based on the analysis results redesign solutions were generated by the design team. (See Fig.2 for one of the solutions). The redesign shown has eliminated the Bobbin component from the stack. The Magnetic Pole (molded into the Bobbin) has been positively located against a machined step in the Body component. Fig. 3 illustrates further the original and redesign solutions. (The body was already machined at one end to provide location on the Fuel Port Block). (PBT with insert) No longer in the tolerance stack! This Case Study has been reported previously in the paper 'Process Capable Tolerancing' published by Machine Design, see Tolcap Resources. The analysis given here has been carried with the current version of Tolcap and consequently there are some small differences in Cpk predictions and capable tolerances for some of the components when compared with the analysis reported in Machine Design, which made use of an earlier release of the software.